The best way to think of the CT 200h is as a better-looking Prius Sport, if such a model existed. It shares the Prius’ hybrid drivetrain, with its 1.8-liter four-cylinder engine and electric motor, but it now has a “Sport” mode that ups the power to the electric motor for an extra boost of speed when you drop the pedal. It won’t give the IS F a run for its money, but it feels noticeably quicker than driving in “Normal” mode, which essentially mimics a Prius. What we could test was the CT 200h’s ride quality, which was quite good. On the rough pavement that is L.A. city streets, the car rode well and soaked up even large bumps nicely. It’s a tad firmer than you’d expect from a Lexus, given its sporty disposition, but nothing that would scare the average Lexus shopper out of the car. 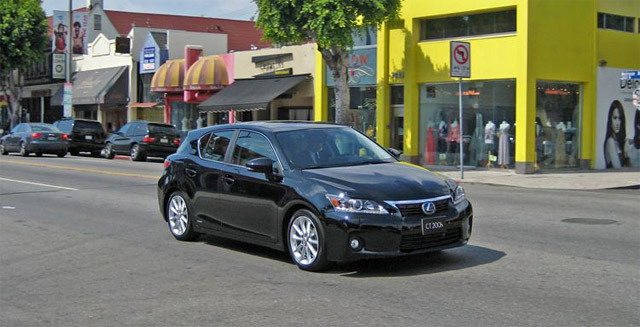 Around town, the CT 200h feels quick enough for L.A. traffic. Although we didn’t want to risk small-arms fire from other motorists, we found we could get pretty close to the claimed 28 mph limit on battery power alone before the engine kicked on. When it is on, the engine emits a low growl that at least sounds sportier than a Prius. Motor Trend wasn’t without complaint — they found the steering “light and lifeless”, even in Sports mode, and weren’t all that impressed with the interior design, which they thought was “simple and utilitarian and mostly absent of stylistic touches”. While I don’t agree with all their points, especially when it comes to the interior, I’m enthused by their generally positive reaction. More importantly, it’s great to finally be seeing some feedback on how the CT really drives, and honestly, I’m surprised that only Motor Trend crashed these CT 200h events — I expected a bunch of publications to do the same exact thing.